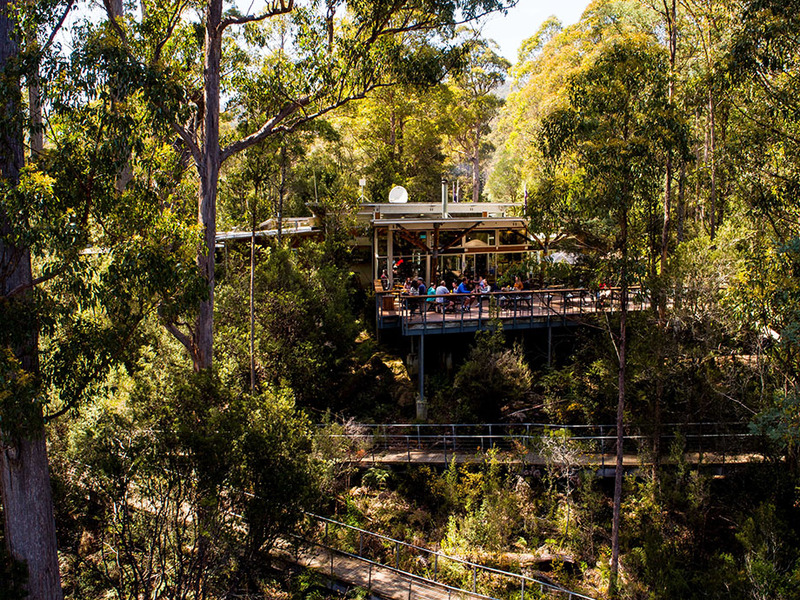 Closed up to 31st August 2019 due to bush fire damage in the area. Please refer to Tahune Adventure's website and social media accounts for details. Closed temporarily until 31st August 2019 due to bush fire damage in the area. Please refer to Tahune Adventure's website and social media accounts for details. River – forest – sky – discover them all at the exciting new-look Tahune Adventures Tasmania, one of our island’s must-visit destinations. It’s a comfortable and scenic 90-minute drive south from Hobart to Tahune Adventures. The road from the city takes you through the Huon Valley, with its orchards and farmlands, then alongside the broad Huon River, passing the riverside town of Franklin, home of the Wooden Boat Centre and through the timber town of Geeveston on the fringe of the mighty Southern Forests and the Tasmanian Wilderness World Heritage Area. 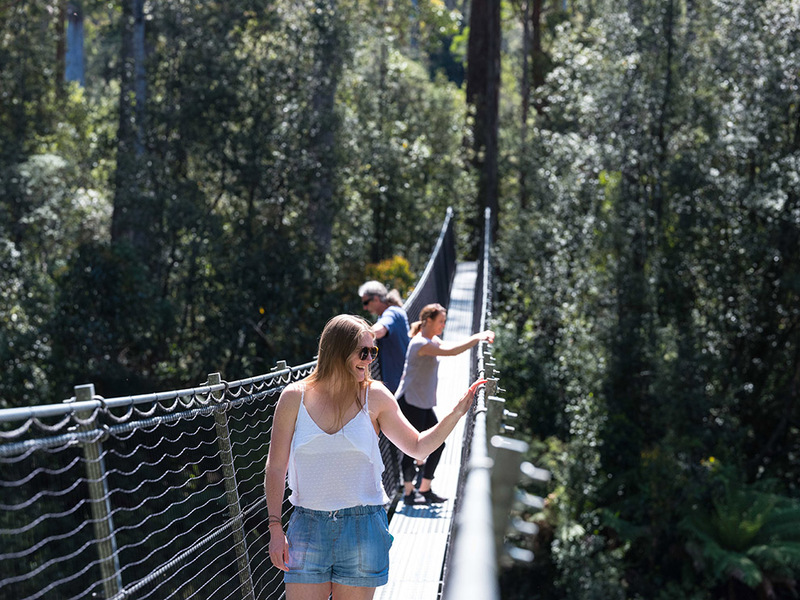 Walk high above the forest canopy on our iconic attraction, the famous Tahune AirWalk, sharing the lives of the forest giants from up-close, looking down to the place where the wild waters of the Huon and Picton Rivers mingle. 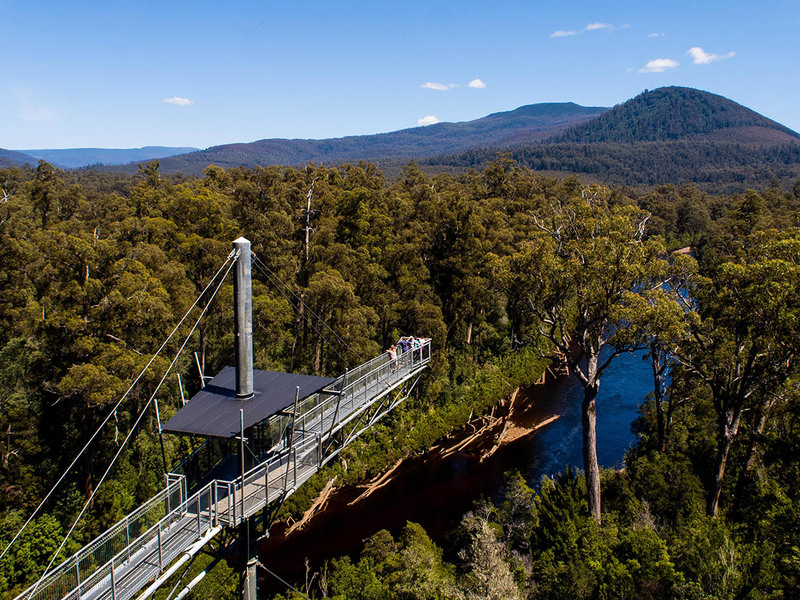 The 600-metre walkway ends at a spectacular cantilevered platform 50 metres above the riverbank, with views extending to the mountains of the World Heritage Area. Allow 1 hour to complete the walk. Basic fitness is required and wheelchair access is available on the AirWalk, onsite shuttle bus available upon request. Feel the power of nature walk as the rushing waters of the mighty Huon and Picton Rivers mingle right beneath your feet, on two swinging bridges suspended from the river banks. The track allows walkers to discover the early European history of the area on this trail to the ruins of the house occupied by Police Constable Francis McPartlan, a former Irish convict whose duty it was to walk the trail to the remote Arthur Range to check timber licenses. The Swinging Bridge Track is part of your general admission to Tahune Adventures. Allow 1.5 hours return. Huon Pine Walk The Huon Pine Walk is a tranquil stroll along the riverbank and is easily managed by most people, it is one of the best places in Tasmania to see young and mature Huon pines growing in their natural riverine rainforest environment. The Huon Pine Walk is part of your general admission to Tahune Adventures. Allow 20 minutes return. Tahune Adventures Visitor Centre features a licensed café serving dine-in and take-out meals, and a free WiFi so that you can stay connected to the rest of the world. For those seeking a more informal dining option, there are barbecue and picnic facilities located around the site, which are available to visitors. We can also cater for larger groups and functions in our private Bluestone Shelter building. Make sure you bring comfortable walking shoes and walking clothes as this journey typically takes 50 minutes. We also recommend you bring a camera to capture all the beautiful views! Open daily: 9am-5pm October to March, 10am-4pm April to September (closed Christmas Day and during hazardous weather conditions). Outside hours available upon request.